A highly anticipated match up awaits as the star-ladened Thunder visit a Spurs team that has won its last 18 games. Game 1 tips off Sunday. Many people seem to be stuck in the past when it comes to the Spurs, seeing them as the same old-fashioned, half-court, defense-oriented team that won them their first four championships. But in reality, their style resembles the uptempo pace of the Thunder. The Spurs boast the highest octane offense in the league. They rank No. 1 in the playoffs in both points per game and field goal percentage, with the Thunder trailing them at the No. 2 spot in both. We can expect an old Western-style shootout come Sunday, with the victor showing a knack for dominating the glass and winning the turnover battle. In short, extra possessions are ultimately going to determine the outcome. As far as rebounding goes, the Spurs have the edge on the Thunder by the slightest of margins so far in the playoffs. But with Tim Duncan's revitalized play and claim that he feels better than he has in years past, you can expect him to be very active on the boards. The 29-year-old-looking Duncan won't be able to do it all on his own, though, and he will need the help of Boris Diaw and Tiago Splitter to compete with the athleticism, tenacity and brute strength of Serge Ibaka, Kendrick Perkins and Nick Collison. Another focal point of the two teams' game plans will surely be winning the turnover battle. The Thunder struggled with this in the regular season, turning the ball over at a league-leading rate of 16 a game. To the surprise of many, OKC has made a complete 180 in the postseason, cutting that number to less than 11. This no doubt comes as a result of head coach Scott Brooks' unrelenting effort to improve the stat, combined with Russell Westbrook's improved ball security. 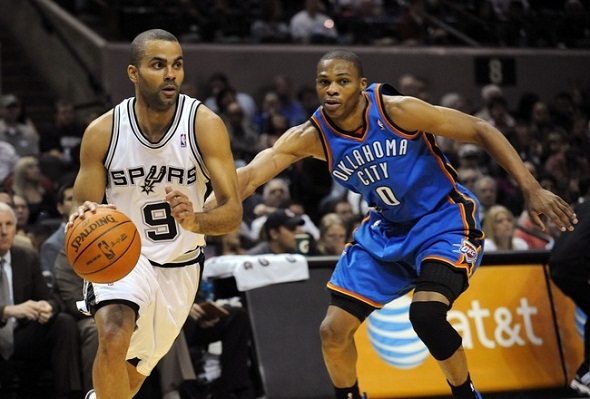 The Spurs' control of the rock will start and end with point guard Tony Parker. The Frenchman is coming off his best true-point guard season and will be leaned upon by coach Pop to orchestrate and lead the Spurs' offensive attack. Expect this series to go to six or seven games, with each one ending in emphatic fashion. Because of the Spurs' home court advantage, experience and veteran-laden cast, I expect them to move on to their fifth NBA championship in the Tim Duncan era. Which team do you think will win 2012 NBA Western Conference Finals?